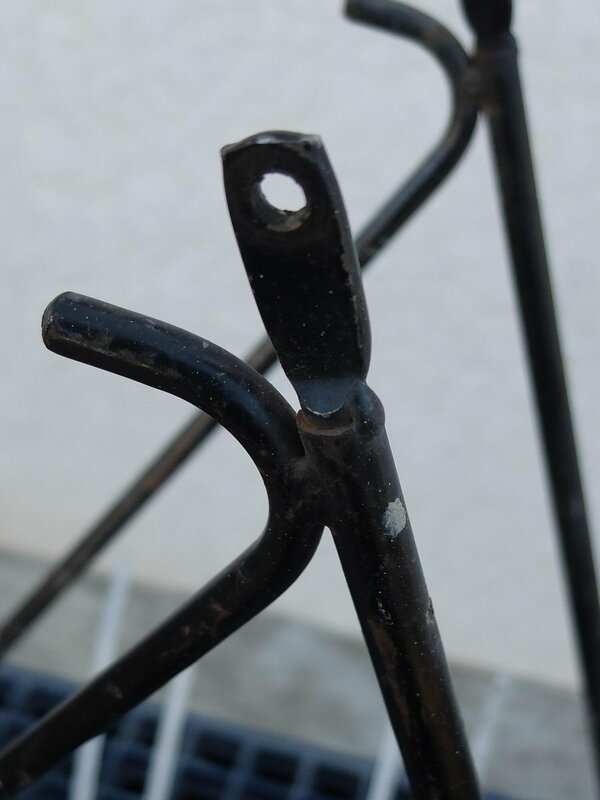 Hi, what you see before you is the dropout mounting end of a steel pannier rack. The rack is made from tubing and is terminated with these drilled lugs. I'm looking for some of those. For those who build frames, you ever seen anything like it in a supply store somewhere? If so, I'd sure like to know where in order to buy a few different sizes. Thanks a bunch for any assistance... ! I built a very basic rack many moons ago and just used a bit of round steel rod that fitted inside the tube. Heated it red hot, hammered a flat, drilled a hole and cleaned it up. Looked as good as anything else i have seen, not that i spend much time oggling racks. Last edited by mikeread; 04-12-19 at 04:49 AM. Hmmmm, ok thanks fellas. If you put in enough time it's possible to develop any skill. I did think about flattening/drilling rod stock but to play around and get it right might take significant time. I just wanted to get the thing over with and if a pre-made insert is there then that's the preferred option. We'll see! It would be kind of fun to do some minor metalsmithing though. As far as the rack tabs indicated on those websites, would those be strong enough to support all the weight? The tabs are to stabilize the rack topside and the dropout eyelet junction the brunt of the load. As far as the rack tabs indicated on those websites, would those be strong enough to support all the weight? The tabs are to stabilize the rack topside and the dropout eyelet junction the brunt of the load. The rack tabs in the links we shared are stronger than the ones on the picture in your OP. But it's all in the details, you didn't really say what you wanted to do with them. HI Unter, how can one tell which has greater strength just by a few photos? I'd planned on doing the same thing with the ends on the sample pannier rack in the pictures; weld them into the ends of some tube stock which will be the loadbearing end of a DIY pannier rack. I can't tell how deeply inserted they are into the tubing yet I assume they'd be deeper than the shallow tangs on the rack tabs. I also assume the example ends are round like the tubes themselves. Yes, I'm making assumptions. However, the ones in your picture are almost surely low carbon steel vs. alloy steel in the case of the ones intended for frame builders. If you look closely at your picture, you can see the ends are just tack welded on. This application doesn't really require a lot of strength and the rack ends are mostly in compression. 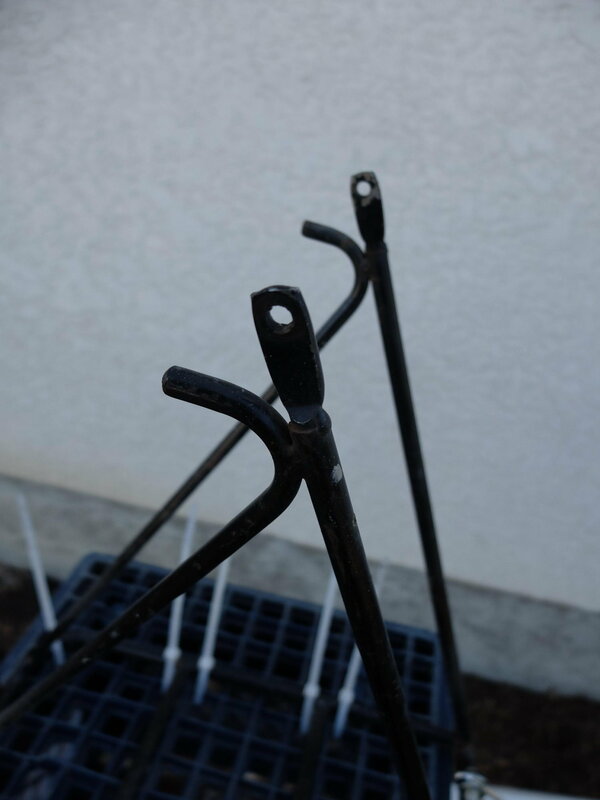 If you think of the millions of miles of abuse tourists gave the old Pletcher rat trap racks and the extremely low grade materials they were made of, strength really isn't a worry. The ends on the rack in your picture probably extend fairly far up into the tubing. This makes up for a lot of sins. It would be difficult to replicate this design. Success really depends on your fabrication skills and equipment. The tabs companies sell to framebuilders are intended for use in a way that is tailored for construction techniques that are available to framebuilders but might not be that easy to use for someone starting from scratch. When I make stainless racks, I cut my own tabs out of bar stock. You could make a tab that fits up in the tubing and then close the gaps on the sides of the tab with weld or even just crush the tubing. A hammer will do that pretty well if you are careful. It's something to consider. When I make stainless racks, I cut my own tabs out of bar stock. Hi Unter, thanks for those insights. I'll probably just fab some tabs - hey, that rhymes. I've bent the tab end on racks before because I tend to overload the back end but that's just the way it is sometimes. Mind you, those were alu-alloy and not that highly rated. Some newer Axiom alu racks are rated to 110lbs capacity , which I'd consider exceeds a safe carrying level on the rear of a bike anyways but unfortunately the layout of those heavy duty Axioms don't match my dimensional criteria. I won't be doing most of the work on this rack but will farm it out. I just want the thing done minus the diy learning curve involved this time around. Last edited by prairiepedaler; 04-16-19 at 09:21 PM. HI Andy, I would tend to agree with that. I'm trading time for skill building this time around. My cup already brimeth.